Just before I turned 40 my dream finally came true. Lacey, my horse, has taught me so, so much. We have developed an amazing bond of trust over the years. 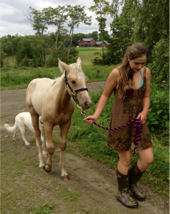 My daughter and husband are also avid horse lovers and we love to trail ride. 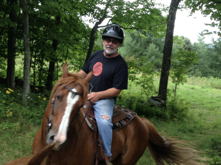 Principles of Yoga horseback: Rooting into the ‘seat’, hugging the muscles to the bone, lengthening through our crown and applying mindfulness as we connect with the horses and venture out into the woods. Cues to incorporate more principals of yoga will be shared throughout the ride. 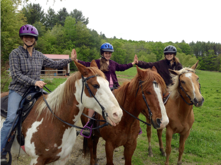 Zack, Alexandra, and Karen each provide ground lessons and 1:1 basic riding lessons. Riders need to demonstrate their ability before venturing out into the woods for a trail ride. Lessons with Karen will incorporate the principles of yoga. This is a basic, backyard opportunity to learn about and connect with horses. 1 hour back yard basics : $25.00- this includes learning how to groom & tack up the horse & safety; can work up to a trail ride lesson once the rider demonstrates enough confidence & knowledge. 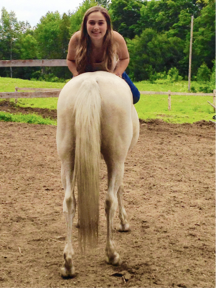 1 hour with Karen and integrating Principles of yoga/ moving into yoga postures on horseback. $40.00. 1.5 hours 55.00 hours with Karen and integrating principles of yoga & moving into yoga postures on horseback. Multifamily discounts available and a sliding scale is also available if needed. Contact Spirit Flow Pathways today to learn more! Click here for our Liability Waiver.